Because we are still expanding our retail reach, seed sales alone are not able to cover the costs of keeping the Truck Farm on the road so we have put together an Indiegogo campaign to help cover the costs. There are lots of great perks that we created for this campaign so they are not available anywhere else. We have even put together a Truck Farm tour for any hardy individuals who would like to have a tour of various Urban Farms in Vancouver (or we could just go for a picnic!). We aren't trying to cover huge administrative costs (this is family run and mostly I do all the design, advertising, social media, etc). We aren't asking for something for nothing - we have put together some great perks that you won't find anywhere else, like Truck Farm mini seed packs, Truck Farm postcards with valuable advice and Special Edition Truck Farm seed collections. You can even sponsor a garden patch at a school or daycare, or donate a Truck Farm Harvest. Why grow plants in the back of a truck? • Teaching kids about growing food from seeds is one thing, showing them food growing in unique and unusual situations is much more inspiring. 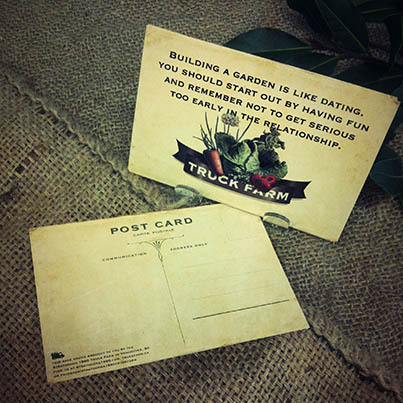 • If you want to really engage people you need to create an emotional connection with them; when people see the Truck Farm, they can't help but smile. When we hand them a pack of seeds it really means something; they are more likely to take home that seed sample and try it out. If we were on a street corner handing out brochures, the impact would not nearly be the same. • The Truck is unique and enables us to offer support to other groups in Vancouver who are teaching kids about growing, cooking and nutrition. 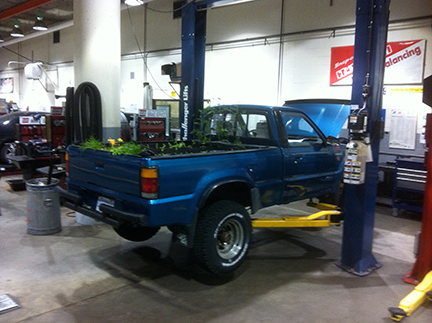 When I came up with the idea to turn my old Mazda into a Truck Farm, I had no idea of the journey it would take me on. Inspired by the original Truck Farm from New York City and my Cantonese neighbours who grow an amazing amount of food in their tiny garden strip, I filled my 1993 Mazda with a colourful harvest including tomatoes, carrots, chard, edible flowers, mustards, kale and, at one point, a Christmas Tree. There were a few hiccups along the way. The truck had not been driven in 6 years and needed a little TLC. I was helped in this regard by the automotive students at Vancouver Vocational College and my friends over at the Lower Mainland Christmas Bureau who helped me pull off the old winch, grind the rust off the bumper and apply a liberal helping of duct tape in appropriate locations. Since those early days, the Truck Farm has become not only a mobile demonstration of small space gardening, it now helps teach school kids throughout Vancouver about growing their own food, and has given me and and my occasional sidekicks the opportunity to meet of the most interesting people in Vancouver - including two mayors, writers, artists and an amazing number of nostalgic people who grew up on farms. The Truck Farm has become an icon for Strathcona 1890 Urban Seed Collections which I launched to help support my family and the many volunteer projects I am involved in. I drive it around Vancouver and park in high visibility locations in order to engage people about urban food growing and give them a sample pack of Truck Farm seeds to help get them started. These are super easy kid friendly heirloom seeds like Little Marvel Peas or Scarlet Runner Beans. The Truck Farm is getting so good at its job that often it works solo. Soon it will be on display as part of the Sustainability Exhibit at the Telus World of Science (aka Science World). The Truck Farm will also be at various Farmers Markets and Craft Fairs this spring and summer before it goes on exhibit at the PNE. Who knew my little truck could get so busy! So far the Truck Farm and all the programs have been supported by the sale of seed collections (with a little help from my regular work). My ultimate goal is to make Strathcona 1890 Urban Seed Collections a sustainable business which will help create employment opportunities in Vancouver's Downtown Eastside. Job creation will be focussed primarily on youth, single parents and people living on disability. Proceeds from sales of these unique collections of seeds also help develop sustainable food growing programs at Vancouver’s inner city schools, daycares and community centres. I am currently involved in a vertical food wall being installed at RayCam Community Centre in the DTES and hoping to create a teaching garden at Lord Strathcona Elementary School. In order to make the seeds appeal to people who normally don't garden I took the guess work out and made the seeds more inspiring - something people will buy as a gift or a little something special for themselves (as opposed to a pile of seed packages that will slip behind the coffee maker and be forgotten). With the help of some very knowledgable people, who have been in the seed and nursery industry for over forty years, I compiled collections of open-pollinated, non-gmo seeds for container gardens on urban balconies, roof top gardens and window boxes. I wanted collections that people with small yards or even no yard at all could grow in order to produce a portion of the food they eat. This would cut down on our their carbon foot print as well connect people with the very nature of their food. The packaging is a labour of love and allows me to release some artistic energies. • Exhibited at the Pacific National Exhibition The PNE boasts over a million visitors during its 3 week run - we ran out of seed samples pretty quick. 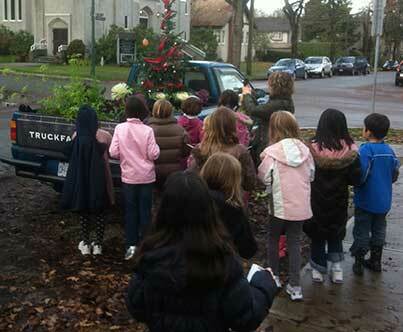 • Worked with kids and helped grow gardens at three of Vancouver's Downtown Eastside Daycares. • Currently working on the food wall at RayCam Community Centre to teach the kids about growing their own food, which they will also get to eat. Apart from helping organise and source materials for the project, we are in the process of growing close to 2,000 seedlings to plant in the wall. This year our goals are to expand our educational programs in schools, community centres and daycares, increase the amount of exposure the Truck Farm receives in order to engage more people in the importance of growing even a small amount of their own food.